I have heard the future: it is Mozartian and it works; it is, moreover, to be seen and heard here and now, in Berlin’s Pierre Boulez Saal. Last summer, I enthused about the West-Eastern Divan Orchestra’s three final Mozart symphonies with Daniel Barenboim. I shall not read my review until after having written and posted this; yet, outstanding though those performances were, this was even better, not least thanks to the salle modulable, whose properties come, like Mozart’s music itself, to seem more miraculous with every encounter. As with the Schubert symphonies (Barenboim and the Staaskapelle Berlin) of a week ago, Barenboim turned the orchestra round at the interval, affording us a difference of aural and visual perspective that put me in mind, however fancifully, of Boulez’s own Répons. (Now there is a thought for the hall…) There was, rightly, no scaling back: Barenboim deployed a full(ish) complement of strings (12.10.8.6.4) and the results were almost everything Mozart might have wished for. Listen not to the authenticists: Mozart was perfectly clear that he wanted as large an orchestra, preferably larger than this, as was possible. Whatever they are preaching, it is not ‘authenticity’, certainly not in the large halls of today. To hear an orchestra such as this in a hall of this size, blessed with so warm and clear an acoustic is to get closer than most. Having mentioned the hall, though, very much part of the performance, as Barenboim clearly acknowledged at the close, I shall return it to the background, for the greatest achievement remained, as it always will in performance, that of the musicians. The E-flat major Symphony received a performance still more ‘Beethovenian’, to use a shorthand concerning whose efficacy I remain unsure, than I can recall previously from Barenboim. I shall try to explain what I mean, and leave it to you whether I should simply have stuck with ‘outstanding’, which it undoubtedly was. The magnificent warmth of the orchestra, echoing Die Zauberflöte more keenly than ever, full of potentiality was undeniable in the introduction to the exposition; so too was Barenboim’s command of line, which continued, indeed intensified, quite unbroken, throughout the movement, throughout the symphony. Furtwängler would surely have nodded approval, although I wonder whether he might have found his anointed successor ever so slightly on the stern side here. (I did not; there is no one ‘right’ way.) Liminal mystery gave way, or rather resulted in, if you will forgive the metaphors, an exposition that itself took on the form of an extended Mannheim rocket, Kant’s ‘starry heavens’ its theatre. If the second subject were more courtly, more demure, it nevertheless arose out of the material, never merely contrasting with it. The concision of the development seemed ever greater on this occasion, the recapitulation reached, almost alla Mendelssohn, at a point of exhaustion, after which invention rose to still greater heights. This was champagne, yes, but with its pinot noir standing out for all to hear – and taste. The second movement emerged as a profoundly dialectical struggle, miraculously reconciled, or so it seemed. Charm and fury, melody and harmony worked their magic. 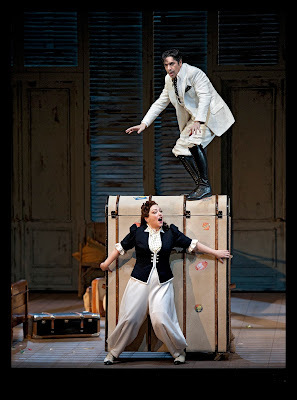 Again, there was gravity, but there was hope, even the Hoffnung of Fidelio. This mattered every bit as much as the slow movement of the Ninth Symphony. The Minuet, taken on the cusp of three and one, was fast, perhaps surprisingly so, but it could yield and did, and not only in its Trio. The finale blazed with the integrity of Haydn, of Beethoven, even of Schoenberg, but the blend of its grapes could have been effected by no other musical vintner. This was, I think, the most modernistic Symphony no.39 I have heard, at the very least since Michael Gielen’s wonderful, sadly underrated, recording. The G minor Symphony opened with the urgency of Furtwängler, if not quite his speed (although not so far off). Drama and line co-existed, or rather thrived upon one another. This time, Barenboim took the exposition repeat: it sounded and was necessary. Likewise the slight yielding for the second subject. That greater breadth – or different breadth, there being, of course, no introduction – in turn necessitated the strangeness of the development, in which contrapuntal clarity proved so crucial. Again, the recapitulation was upon us before we knew it, proving all the more developmental (yes, Beethovenian) in this case. The fall to the tonic minor spoke of unexaggerated tragedy, which yet developed into something all the more tragic. If I say, quoting Mozart in another context, that the slow movement flowed like oil, then that implies no loss to its gravity. It spoke unmistakeably of Bach at times, contrapuntal string variegation telling as much of the 48, so cherished by Mozart, as of the orchestral Bach. Tragedy was again the guiding principle of the Minuet, relieved by its Trio, yet we all knew that it would prove but momentary, such was the strength of line, the pull of tonal gravity. Still more so was that the tendency of the finale, any turn to the major mode all the more agonising for it. This was as grand a tragedy as, and yet, of course, more unalloyed than, Idomeneo, Bach supplanting Gluck. Where Barenboim’s recent Jupiter Symphony with the Vienna Philharmonic had proved relatively disappointing, this West-Eastern performance proved the truest of climaxes. The young players sounded so much more immediate, their performance so much fuller of life, that one might, however unwisely, have forsworn Vienna for life, or at least for a month or so. Barenboim imparted pomp and grandeur to the first movement, yes, but also an urgency that seemed to derive from what we had heard before the interval, the concert concerned with a triptych that took form in more than name. Rhetoric was more overt, but that goes with the territory. It made me think how I should love to hear him turn to La clemenza di Tito. Who knows? He conducted his first Gluck opera only last year. Back to Mozart, though: how the richness of the strings resounded, and how the division of violins, right and left, told, ‘echoes’ so much more than that, properly developmental. The bass line growled in the development as if it were Beethoven ‘ripe for the madhouse’, and yet, before one knew it, the music would again be all related sweetness and light. The thrill and satisfaction of the return and close was experienced as if an overture to the rest of the symphony. In the second movement, the passion lying under the veil of muted strings seemed to speak of an aria that, having no words, could be, still more become, so much more than an aria. This had all the depth of Beethoven, but the spirit was entirely Mozart’s own, far closer to his piano concertos than to any symphonic successor. If I say its length was heavenly, I mean just that: not the back-handed compliment sometimes paid to Schubert. The Minuet took us to the Redoutensaal of our dreams, albeit thoroughly grounded in harmony. Its Trio sounded more intense still; this was no moment for relaxation. For the finale, that eighth wonder of the world, needed to fizz and to erupt, and how it did. Brilliant, Don Giovanni-like display, aching, Elvira-like tenderness, emotional representations of so many of Mozart’s characters were united in a symphonic argument that was taut yet far from relentless or unsmiling. Every flourish, every sigh came from and led somewhere, until we reached the coda: a climax to what we heard, no mere ‘tail-piece’ on this occasion. Is this the greatest of all symphonic finales? It certainly has, and in performance had, nothing to fear from comparison with Beethoven. He never exceeded it; how could he? This was not just the music of the future; it was the music of the spheres. A much discussed – and much praised – recent recording of The Seasons has been that from Paul McCreesh and his Gabrieli forces. I have not heard it yet, although I wrote the booklet note; a copy is, I believe, awaiting me on a brief return to the United (sic) Kingdom next month. However, I know that it is sung in English, and on the grandest – authentic in the proper sense – scale. Trevor Pinnock’s Leipzig Gewandhaus performance was, naturally, sung in German, and with small forces: strings 10.8.7.4.4, and two small choirs coming together to make one chorus. What may occasionally have been lost in grandeur, though – this was definitely more Marriner than Karajan – offered compensations in terms of intimacy (not, of course, that we should fall for the canard that such need be lacking in larger-scale performances). There were a very few occasions when the string tone was a little thinner than might have been ideal; Simon’s aria at the beginning of Summer was one, following a finely veiled (vibrato withdrawn) introduction. More often than not, though, the litheness we heard in the very opening number proved far from antithetical to warmth and cultivation. Perhaps Pinnock’s concentration, or communication thereof, was nodding a little in those early minutes of Summer, for the soloists’ lead-up to Sun’s full majesty was a little sluggish. Thereafter, though, in that Trio and Chorus, majesty and thrills were in full supply. Timpanist Mathias Müller, chose his sticks and general approach carefully: this was anything but a one-size-fits-all approach, as befits so vividly colourful, temporally (and climatically) transforming a score. the distant thunder in Simon’s recitative, ‘O seht! Es steiget in der schwülen Luft’ a case in point. I loved the general uncanniness in that calm before the storm, which then came, if not quite de profundis, then certainly out of the dark. The way, moreover, in which the music picked itself up, as it were, with Lukas’s ‘Die düst’ren Wolken trennen sich’ was spot on: credit both to Daniel Behle, orchestra, and conductor. When tempi were swifter than ‘traditional’, as in the Chorus in Praise of Industry, the result was light of foot rather than uncomfortably driven. Behle’s relatively light tenor did not lack depth or seriousness when called upon. It matched well Christina Landsamer’s soprano, possessed of equal clarity and cleanness of line, although sometimes a little unclear of diction. Both are undoubtedly intelligent, musical artists. Michael Nagy’s baritone was for me the vocal highlight, its richness never an end in itself, but the foundation for a wide variety indeed of tonal variegation. At one extreme would be the splendidly grey monotone (if that should not be a complete contradiction in terms) on ‘steht er, unbewegt, der Stein,’ as befitted the words. His sadness at the beginning of Winter – Pinnock’s very slow tempi offering striking contrast with Lukas’s Aria, ‘Hier steht der Wand’rer nun’ – approached hopelessness yet did not capitulate. Even in that relative pallor of tone, there was beauty: Winter indeed, one might say. Choral singing offered many of the same virtues, clear throughout, weightier at the ‘big’ moments, ably supported by resplendent brass (and the rest of the orchestra, of course). If I had my doubts about Pinnock’s brisk, even martial beginning to the final number, more contrast, it seemed, than climax, the stereophony of Haydn’s eight-part choral writing, a question-and-answer cross between The Magic Flute and Israel in Egypt, banished them as swiftly as it did those winter clouds of old age. As part of the Pierre Boulez Saal’s focus on the music of Schubert, Daniel Barenboim and the Staatskapelle Berlin will be performing two cycles of his symphonies. This, with the first three, was the opening concert of the first. It was the first time I had heard an orchestral performance in the hall; I am delighted to report that the acoustic – and indeed the musical – results were just as estimable as they had been with chamber or solo forces. Barenboim used a relatively small orchestra (strings 8.6.4.3.2), whose warm sound veritably filled the hall, without remotely overwhelming it. The First Symphony is far too little heard in the concert hall. It may not be a ‘masterpiece’, but it is a lovely piece, whatever the occasional stiffness of form. (For any instance of that, there will be several anticipations of the later Schubert.) The Adagio introduction to the first movement offered all the warmth and grandeur of Barenboim’s Mozart (most recently, in my case, his Haffner Symphony). There was much of Haydn, too, in its harmonic mystery, likewise in the joy that ensued in the exposition proper. The second subject smiled, as did I, the grace one heard unmistakeably Schubertian. And what an orchestral sound: deep, rich, yet capable of the greatest, ‘natural’ refinement and transparency. Barenboim treated the onset of the development with great drama, with all the seriousness one would expect from the later symphonies. Alas, there was serious disruption to proceedings from one audience member loudly – and at length – telling another to turn off his tablet. The recapitulation thus proved doubly welcome, its majesty again recalling late Mozart, its second subject as lovely as ever. In the Andante, Mozartian grace, married to a more rural, ‘Austrian’ bucolicism (already just a hint of Bruckner), vied with countervailing darker paths, full, although not too full, of Romantic promise and mystery. A slow tempo, at least by standards fashionable today, permitted some gorgeous, heart-stopping moments fully to register. The Minuet, one-to-a-bar, had one foot in the ballroom, one in the concert hall; it was almost, at times, as if it were an operatic representation of the dance. The trio relaxed and lingered just enough. In the finale, we heard an ideal balance between weight and wit, its harmonic foundations and melodic impishness. Delightful! The Third Symphony might, on paper, have seemed to offer a little too much D major in the first half; not a bit of it, though. The grandeur of its opening chord sounded as if to outdo, or to advance upon, that of its predecessor. Then, of course, the music took quite a different path, more musically luxuriant, perhaps. The first movement proved just as sheerly enjoyable as, say, in Beecham’s celebrated recording, but with more overt harmonic grounding. Barenboim, now conducting from memory, would often simply stand back and let his players play. There was no dragging, quite rightly, in the Allegretto. Its unassuming charm seemed once again to evoked the Austrian countryside, the dancing led by outstanding woodwind soloists. The Minuet – surely a scherzo in all but name – was vigorous yet gracious; again, its lilting trio relaxed to just the right degree, as if paying homage to Mozart. The finale seemed keener to pay homage to Haydn, albeit in a thoroughly Schubertian spirit. It was as witty and as serious as I can recall. As the Leipzig Gewandhaus motto has it, Res severa verum gaudium. For the second half and the Second Symphony, Barenboim turned the orchestra around. Whereas previously, he and the front desks had been closest to me, now they were on the other side, him facing me. It is good to see full use being made of the space of the salle modulable to offer different perspectives, both visual and aural (although such is the acoustic, the aural difference was far less than it would have been in most halls). The opening majesty of the first movement was of a different, swifter order, fully in keeping, so it seemed, with the different quality of the material, both in that movement and in the symphony as a whole. There is arguably a greater formal dynamism here, certainly something of a grander scale; so too did it sound in performance, closer to Beethoven, especially during the development, although still quite distinct. It was an especial joy to be seated so close to the woodwind for the Harmoniemusik. The transparency of the Staatskapelle Berlin’s sound permitted the Andante second movement to unfold with love, testament to the still often underrated virtues of Classical variation form. Darker passages were not undersold; nor were they turned into something they were not. Other variations quite simply charmed the socks off this listener. The surprises of the Minuet were relished, its trio again the perfect counterweight. The finale, fast in a way that Mozart rarely is but Haydn often is, once again sounded just ‘right’. Its vigour occasionally looked forward to Bruckner, but remained ‘itself’, a true Schubertian delight. I greatly look forward to the next instalment. Different members of the audience would have experienced this in many different ways. Some many have been there for the first performances; some may even have been there for each cycle. Wagnerians are, after all, fanatical souls; it is safer to think oneself a Wagnerite. Some even came in coach parties, collected from the door each night. (Imagine that happening in Britain for something that was not a West End musical!) I mention that since many would have built up attachments that I did not have – just as I might for a favourite pianist whom I flattered myself I ‘understood’ and could therefore happily forget a few wrong notes. As stagecraft, what I saw was more mixed than was suggested by much of the reaction around me. It was mixed, though, and had enough going on conceptually and in detail to set me thinking more than in some new productions I have written about. 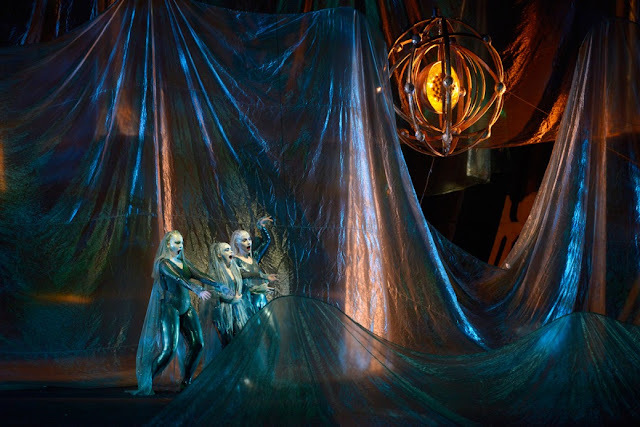 In that respect, for me, Das Rheingold fares best of all. If nothing can approach Patrice Chéreau’s evergreen Bayreuth staging for somehow surviving the ravages of time, this does not do badly at all. The story is told clearly, with a fine balance between ideas and characters. It is always difficult – indeed it should be difficult – to tell what is the work of the original director and what of the revival director, but it seemed to me that Jasmin Solfaghari had inspired her forces with considerable success. Perhaps she was also helped by the conceptual richness of the work, which does, as it were, so much of the work itself. If any one work of Wagner’s is a ‘drama of ideas’, it is surely this. 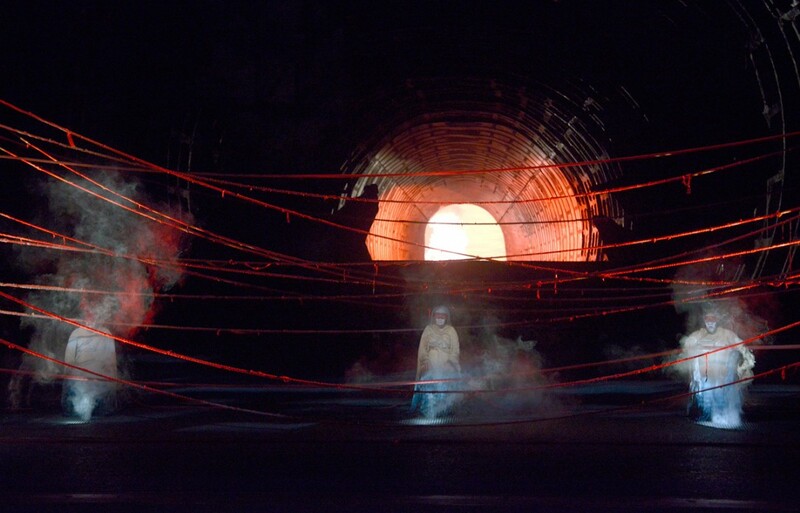 At any rate, Peter Sykora’s fabled time tunnel, here and elsewhere, makes quite the visual – and conceptual – impression. It was intended by Friedrich to convey something of Gurnemanz’s most celebrated line, ‘Du siehst, mein Sohn, zum Raum wird hier die Zeit’ (You see, my won, here space becomes time), thus reading back that strikingly Schopenhauerian and more generally post-Kantian idea back into the abidingly Hegelian, historical cosmogony of the Ring, or perhaps rather taking its shell and filling it with Hegelian content. Such, at least, is my predictably more Hegelian, historical reading, for a Ring without history is inconceivable to me – and, I should argue, to Wagner, the eager student (however much he might later have played this down) of Hegel’s Philosophy of History. The setting for Nibelheim comes across as surprisingly undated. Its emphasis on the marriage between technology and barbarism marries well-nigh perfectly with Wagner’s own premonitions, or presentiments as he would have called them, of a darker age in German history. Adorno would surely have admired that more, had he been able to overcome his lack of sympathy earlier. Alberich’s appearance behind something akin to a shop window captures the avarice, the pretence, and the capital. His ability to control events is real, though. Mime’s pain is clearly no act, and the first ring transformation in particular is as convincingly handled as I have seen: sometimes lighting, or rather darkening, is all you need. 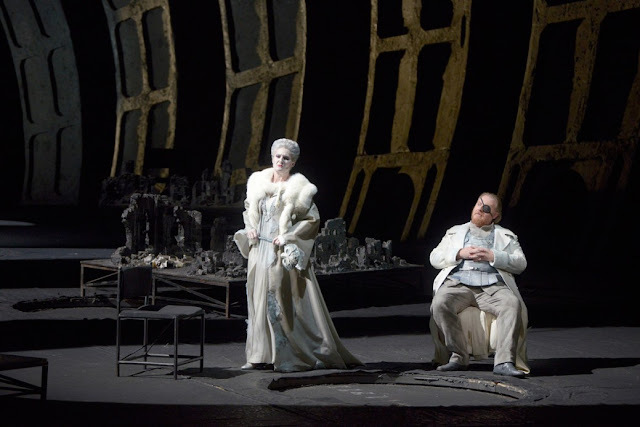 In the second and final scenes, Loge’s availability to all – he is, after all, amongst other things, the incarnation of instrumental reason – is clearer than I can recall elsewhere. 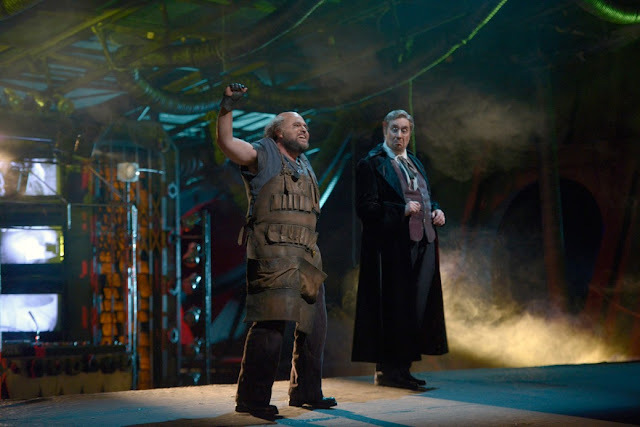 Fricka consults him and he proffers advice; he even wanders off with Fafner, following his murder of Fasolt, before returning to the scene of the crime. 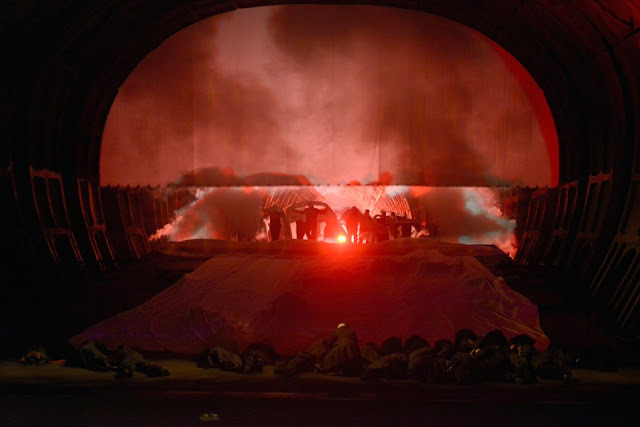 Valhalla is clearly another place, distinguished from wherever it is the assembled company is, and the rainbow lighting of the tunnel makes a lasting impression. Dr Who, eat your heart out, I thought. In a telling touch, what I have written of as the ‘limping aspirant waltz’ of the entry into Valhalla is splendidly choreographed: two steps forward, one back. Writing of Chéreau’s production, Günter Metken likened the entry of the gods into Valhalla to a tableau vivant of Bruegel’s Parable of the blind. There is something of that spirit here too. Cast as these performances were over for just five days, there was some degree of sharing out recurring roles. I have no objection to that at all. 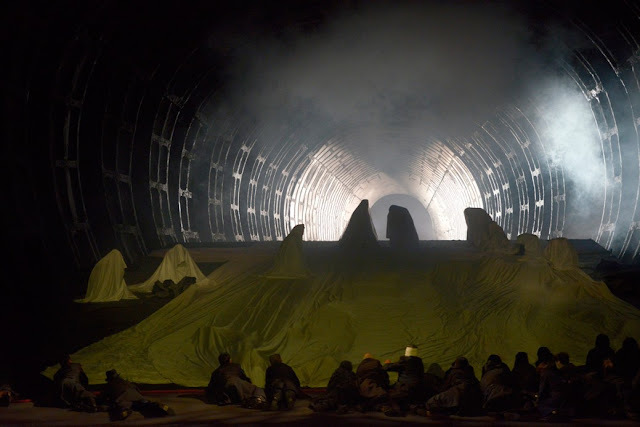 Theatre is not ‘real life’, and there can be advantage not only to different standpoints at different stages of characters’ development, but to being reminded that this is theatre – especially, I might add, for Wagnerians as opposed to mere Wagnerites. (The problem is that the former are likely to be most resistant to such realisation.) All three Wotans had sterling qualities to their portrayals. Derek Welton’s Rheingold god matched youthfulness to power and strength, his turn to thoughtfulness in the final scene, ably picked up by Iain Paterson’s Walküre successor: very much an heir to the sagas, reminiscent in some respects of a young(er) John Tomlinson. Samuel Youn performed a valuable task in reminding us that there is life in the old god yet, brutality especially evident, but in context, I felt this was a little too much Dutchman, somewhat too less resigned Wanderer. Perhaps, though, I am falling into the Wagnerian trap I mention above. There was quite a contrast between our two Brünnhildes. Evelyn Herlitzius, as is her wont, gave utterly committed performances. One has to take the rough – sometimes, I have to admit, the very rough – with the smooth, but one can forgive almost everything when the commitment is such as here. 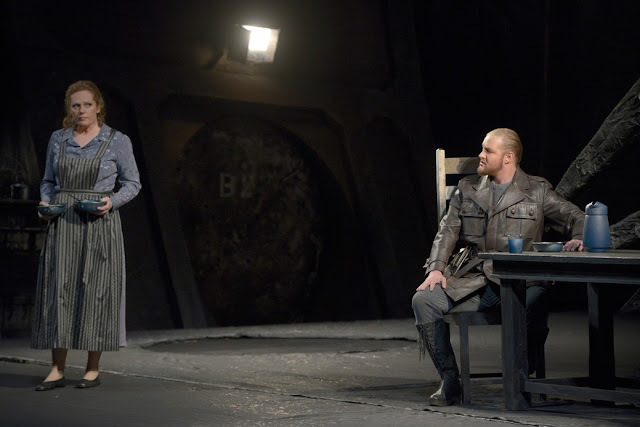 Her turn as the woman scorned in the second act of Götterdämmerung was noteworthy for something that is all too often missed; that is very much part of her ‘elevation’ to humanity. I should not have minded hearing more of the words, though, especially in the grand denouement. Ricarda Merbeth had far less to do in terms of acting – or singing, for that matter. I suspect she might have been parted by the demands of the Walküre and Götterdammerung incarnation, but there were vocal thrills of a perhaps more conventionally ‘operatic’ kind, not unreasonably, to be had in her duet. Michaela Selinger contributed a moving Waltraute, attentive to the text throughout: the greater part of the trick, if we may call it that, here. The other Valkyries were a characterful bunch, more varied in tone than any ensemble I recall. 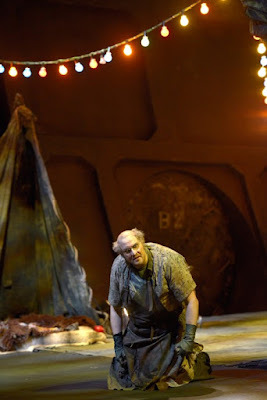 Werner Van Mechelen’s Alberich shifted, as if with the aid of a vocal Tarnhelm, between appearances – until his final, almost Beckettian appearance in that well-nigh incredible scene with Hagen (of which Boulez, no less, spoke with awe). Albert Pesendorfer showed great versatility in shifting in rather different fashion, from a truly sympathetic Fasolt (contrasting with Andrew Harris darker portrayal of the giant’s gangster turned rentier brother, Fafner) to a subtly manipulative Hagen: again offering far more than ‘mere’ darkness of tone. Seth Carico proved an accomplished Gunther. It is a difficult role, since playing ineffectuality should not become ineffectual in its sense. Carico’s acting skills helped greatly here, his fear palpable, without unduly informing smoothness of vocal line – or indeed enunciation of the text. His Gutrune, Merbeth again, with whom there was suggested an all-too-close relationship (perhaps more mother substitute than anything else), could sometimes be a little blowsy and again ‘operatic’; I am not sure that it was really her role. 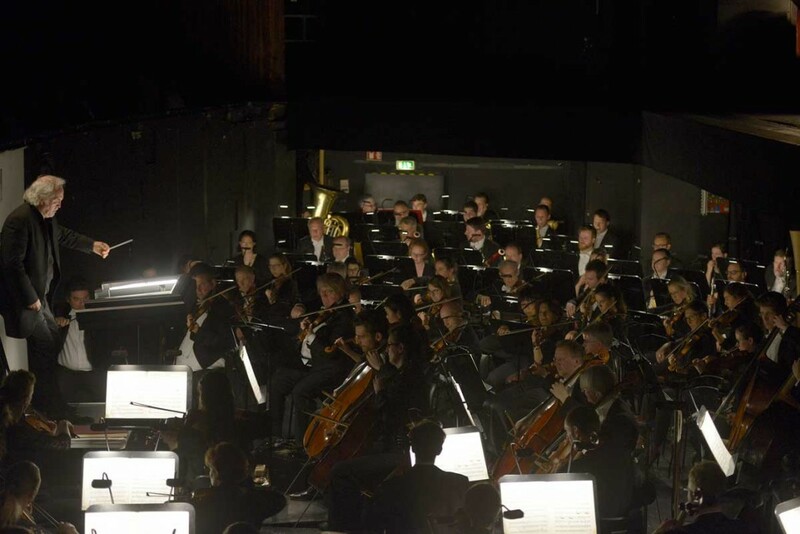 Last but certainly not least, the Orchestra of the Deutsche Oper under Donald Runnicles did a sterling job. One almost always hears a few too many slips in Götterdämmerung, especially from the brass, and such was the case here, but to dwell on that would be to parody Beckmesser. Throughout, the string tone was dark yet commendably clear, not so transparent as that of some bands, but different orchestras have different characters, and long may that remain the case. No one, however often (s)he might have heard the Ring, could have come away from the performances having failed to learn a good deal from Wagner’s modern Greek Chorus. The actual chorus, a hangover but what a hangover from Wagner’s immersion in grand opéra, showed typical excellence in Götterdämmerung. Runnicles was an excellent guide, first amongst equals: supportive of singers without deferring to them. Structure was admirably clear, even if form lacked the last few inches of dynamism one would hear from, say, Daniel Barenboim. Art is not a competition, though, and if I felt a little shortchanged at the end of the first act of Die Walküre, I also recalled that the Staatsoper’s recent (Guy Cassiers) production made a considerably lesser impression than when I heard Barenboim’s concert performance at the Proms. 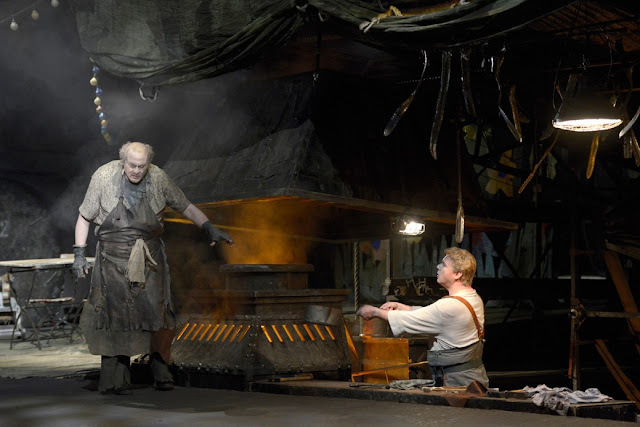 There is much to be said for such an unshowy way with Wagner, not least when one compares it with what London audiences have had to endure since the departure of Bernard Haitink. Runnicles’s wisdom was ultimately not so different from Brünnhilde’s. We ‘saw’ and heard ‘the world end’ – in words of hers Wagner never set, but never needed to; the orchestra sometimes says it all. Brahms and Schoenberg always complement each other well; they certainly did so here, Daniel Barenboim and his Staatskapelle Berlin past masters in the music of both composers. Barenboim seemed to choose just the ‘right’ tempo – not to say that there are not others – for the Theme in Brahms’s Haydn Variations, and indeed for each of the variations that followed, the work very much conceived of and communicated as a whole. Pauses (or not) between movements were very much part of the overall conception in a deeply considered reading that lacked nothing in (apparent) spontaneity. Lightness of touch and depth were revealed as two sides of the same coin, with wonderfully ‘true’ – never more so than in the opening statement of the Theme – Harmoniemusik. Moreover, the string tone we heard in the first variation and beyond simply, or not so simply, sounded just right for Brahms, its darkness undeniable yet never overshadowing. Classicism and modernism, Gemütlichkeit and violence: all manner of dialectics were in play, just as they would be in Schoenberg, albeit with at least a greater pretence at reconciliation. The pathos of the minor mode seemed to look back to Mozart’s Pamina, whilst swifter, more impetuous (yet still controlled) movements, pulsating with life, however mediated, evoked Mendelssohn, Elgar, even, in the eight variation, will-o’-the-wisp Webern. The nobility of the cumulative sweep found true fulfilment in the closing passacaglia. Its victory was not easily won, yet it was undeniable. Magnificent, then, and deeply moving – and yes, the triangle made me smile. Barenboim also conducted Schoenberg’s Five Orchestral Pieces without a score (as he would, unsurprisingly, the Beethoven concerto in the second half). The first movement opened in medias res, Brahms’s developing variation further developed, as it were, albeit with an almost Straussian transformative technique also in play (or so it sounded). What writing this is, and what playing this was from, a huge orchestra! It thrilled, seemingly concentrating the action from an entire operatic scene into its brief duration. The second piece brought seemingly necessary contrast: not exactly relaxation, but a change of pace, at least until its own developing variation gathered its own pace. Schoenberg’s sonorities, whether soloistic or, more often, in combination, beguiled as if they were Mozart’s; moreover, they continued, more than a century on, to surprise. 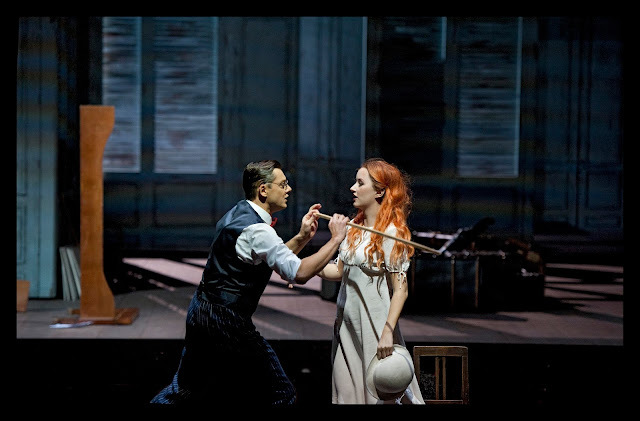 A Mahlerian sense of purpose in performance, married to Brahmsian involvement – in more than one sense – brought a mesmerising experience indeed. The Klangfarbenemelodie of the third movement had one realise quite how far we had come from Brahms, not least in the opening wind chords, which one could hardly fail to compare and contrast with the opening of the Haydn Variations. The occasional slightly awkward ‘join’ is almost inevitable; others were, it seemed, effected by sorcery. Tendencies from earlier movements united and reacted in the fourth and fifth. Violence and its aftershock were very much the order of the day in the close of the former, whilst languor and urgency somehow seemed to coexist with, even incited, each other in the latter. Here there is a phantasmagoria at least as impressive as anything in Strauss, but with a thoroughly Brahmsian grounding. Draining yet exhilarating. Judging by his personal applause for the orchestra, Barenboim was rightly appreciative of his players’ work. Radu Lupu joined the orchestra for Beethoven’s Fifth Piano Concerto. 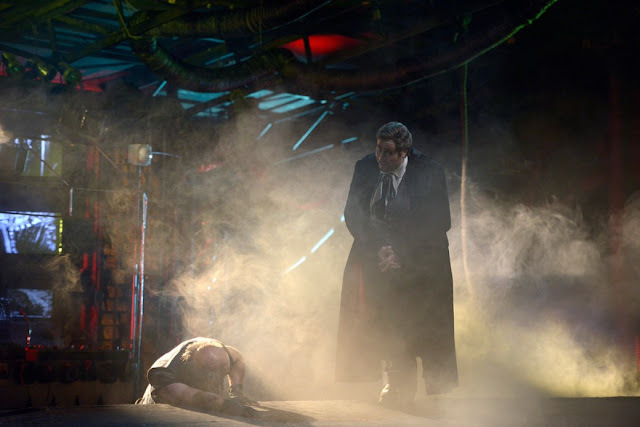 This was not an easy ride, but even when it edged towards – and arguably, on one occasion in the finale, beyond – catastrophe, Beethovenian spirit was ever-present. Beethoven, after all, should never be easy. Lupu’s opening flourish sounded almost extemporised: not arbitrary, but free. Its little smudges did not matter, at least not to me. And what touch! What orchestral weight and clarity, moreover, Barenboim marrying once again tendencies with roots in Klemperer (with whom he recorded this work) and Furtwängler, now so internalised that they seem entirely his own. For he and Lupu undoubtedly understood that the work’s foundation, almost by definition, lies in its harmony. There was something almost Cortot-like, errors and all, in Lupu’s playing: magic in the right hand, of course, but it was the left hand that perhaps intrigued more, the very locus of Beethoven’s struggles. Neither Lupu nor Barenboim was afraid of rhetoric; if you are, this is certainly not your piece. Such rhetoric, however, grew out of the music rather than being imposed upon it. A bardic quality to Lupu’s declamation – Wagner would surely have approved – was also apparent in the slow movement: a reverie more directed, and yet seemingly also more spontaneous, than its counterpart in the previous night’s Violin Concerto with Anne-Sophie Mutter. Lupu touched and charmed, seemingly creating the music before our ears; the Staatskapelle Berlin offered a solemn, dignified ‘backdrop’ that nevertheless wanted nothing in life. The beauty of the transition to the finale might almost have been effected by Liszt himself, the sense of release somehow postponed until the coming of the orchestral tutti, liminality extended. Here one had to overlook a good deal technically, and I can understand why some might not have been able to do so – not that there seemed to be any such reaction in the audience – but even in catastrophe, there was the truest of authenticity. Moreover, whatever shortcomings there may have been in the despatch of the piano part, the electricity of the orchestral performance – how, for instance, motivic development worked itself through the different string registers – was, even by these players’ standards, quite something indeed. A concert very much of two halves, but which half would be which? Sad to say, it was the longer ‘half’, with Anne-Sophie Mutter, which proved frustrating (although not, it would seem, to an often poorly behaved audience: telephones, quadrophonic coughing, chattering, dropping things, etc., etc.) As it was, a truly outstanding performance of La Mer – was it perhaps the best I have heard? – and an excellent account of Berg’s Op.6 Pieces had me wishing that perhaps the Beethoven Violin Concerto had been omitted from a strangely programmed concert. Takemitsu’s Nostalghia opened the concert, and fared considerably better than the Beethoven. The composer’s move ever closer towards (more or less) conventional tonality was to be heard here, yet not entirely unalloyed: post-Messiaen the harmonies might have been, but there were hints of Berg too. Moreover, Mutter’s playing, consciously or otherwise, seemed designed to pick up the intervallic aspects of Takemitsu’s construction, even constructivism, and their implications. The contrast between her tone – for once, ‘glamorous’ does seem the mot juste – and that of the small band of orchestral strings was telling rather than distracting. She and Daniel Barenboim shaped the work’s contours well; attention to detail was equally impressive. The ‘tender and elegiac mood’ of which Takemitsu spoke was evoked, but not at the expense of a ‘merely’ atmospheric account, no more welcome here than in Debussy. That distinction of string tone was also present in the Beethoven Concerto, but it began to take on the characteristic of mannerism, especially when Mutter’s playing with intonation – I say ‘playing with’, since it seemed deliberate – began to grate. Perhaps more disturbing were her sometimes extreme rubato and tempo variation. Barenboim is renowned as a master in post-Furtwänglerian Beethoven, which we might have had chance to hear in another performance; here, too much sounded like a bad parody of Mengelberg. The first movement in particular was listless, at times seeming interminable, even when the tempo was far from ‘objectively’ slow. The magnificence of the moment of orchestral return showed us what we were missing. Interestingly, somewhat perplexingly, Mutter’s account of the cadenza (Kreisler’s, I think) was far stronger in direction, and indeed in expressive range too. Applause at the close of the movement was as unwelcome as it was predictable, although it was probably preferable to another extended bout of bronchial display. The slow movement was better: broad, with undeniable intimacy for much of its course. Characterful solo voices from the Staatskapelle Berlin – the bassoon in particular caught my ear – were a delight. A reverie, with sterner moments, then, whose spell was broken by a vigorous, even dashing account of the finale. If only the first movement had borrowed a little of that vigour! Now the orchestra really played out and Barenboim seemed far more in control. Once past the bizarrely bronchial sunrise, impressively handled so far as one could tell, Barenboim’s La Mer achieved perhaps the most truly symphonic stature I have heard. It is certainly not the only way to perform this work, but it was mightly impressive. The great sweep of the first movement, and indeed beyond, was enhanced by equally fine attention to detail. The climax rightly grew out of and yet also transformed what had gone before. There was no lingering, rendering its impact all the greater. ‘Jeux de vagues’ emerged as a glittering orchestral scherzo, with all the dynamism of (if a different dynamism from) a scherzo by Mahler or Brahms. Cellos drove, or so it seemed, the harmony as well as the rhythm. The ‘Dialague du vent et de la mer’ opened as ominously as any symphonic finale (that to Berg’s Pieces included, if we may include them). Its dark malevolence looked back to Parsifal but forward too. During the course of a struggle that was avowedly musical rather than pictorial, quintessentially Debussyan magic and mystery sounded reborn. Sonic mystery of a different kind enabled the very components of Western music to emerge in the opening of Berg’s ‘Präludium’: an exaggeration, perhaps, but there was a real sense, even, in theological terms, a real presence, of the instantiation of harmony, melody, rhythm in that creation. (I often think of this opening as a counterpart to Haydn’s ‘Representation of Chaos’. Here it stood, or so it seemed, midway between Haydn and Varèse.) The strangeness of this music remained undimmed; it was no orchestral showpiece that we heard. ‘Reigen’ danced as it must, but it was the evolution of that dance and its subsequent development that registered especially strongly. Fragments of old Vienna were remembered, misremembered, invented; they filed past us in a ballroom that disintegrated before our ears. Line here proved as crucial as in La Mer, or indeed as in Barenboim’s Wagner. A similar thing might be said of the ‘Marsch’, save for its necessary dissimilarity and contrast. The insanity and downright barbarism of the huge orchestra and its music was celebrated, then distilled and dissolved, reinstating the unspoken presence of Mahler, even prior to the hammer blows. Berg claimed that Mahler’s modernity over Wagner was in part a matter of saying, with Nietzsche, yes rather than no. Here, Berg seemed to say yes, no, maybe, all manner of things. If there was not quite the clarity that Pierre Boulez, with no sacrifice to its emotional range, used to bring to performances of this music, Barenboim and his orchestra offered interesting new perspectives of their own. This is music we hear far too infrequently; there really is no excuse.